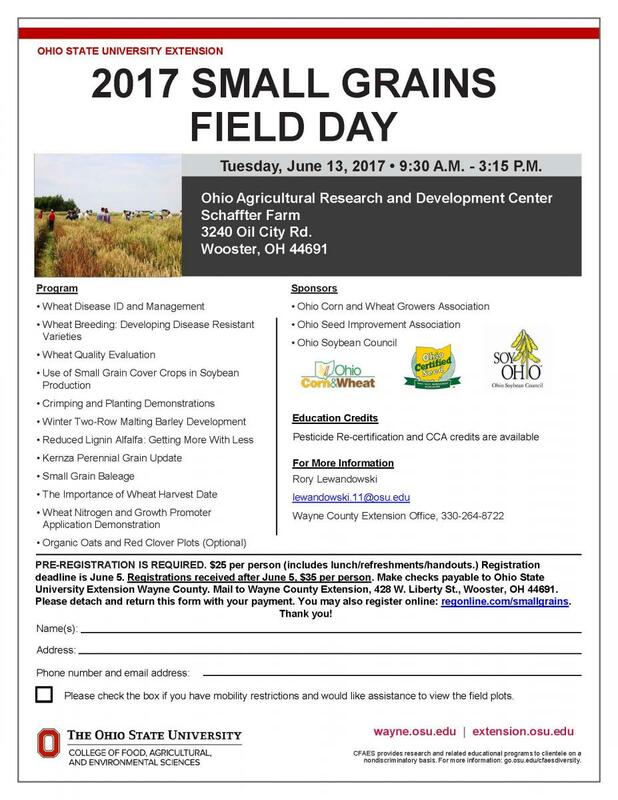 Come out to Schaffter Farm on Tuesday, June 13 for Small Grains Field Day! PRE-REGISTRATION IS REQUIRED. $25 per person (includes lunch/refreshments/handouts.) Registration deadline is June 5. Registrations received after June 5, $35 per person. Make checks payable to Ohio State University Extension Wayne County. Mail to Wayne County Extension, 428 W. Liberty St., Wooster, OH 44691. Please detach and return this form with your payment. You may also register online: regonline.com/smallgrains. For more information, contact Rory Lewandowski at lewandowski.11@osu.edu or 330-264-8722.